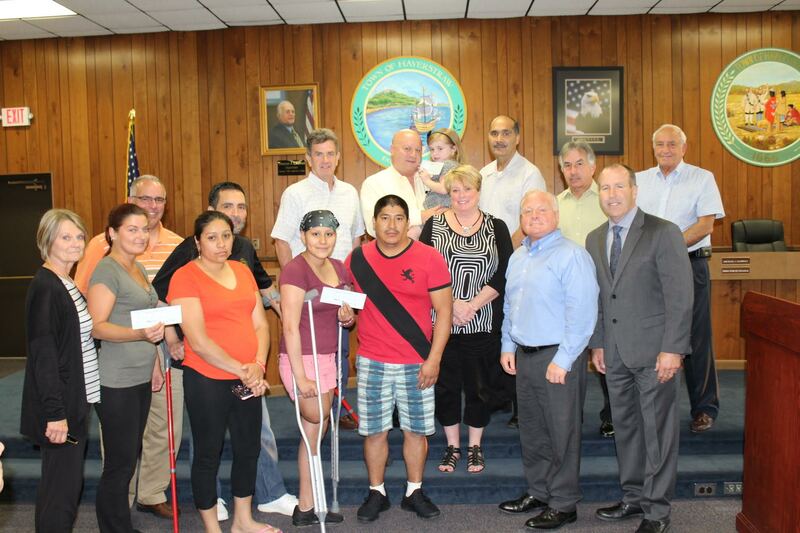 At the Haverstraw Town Board meeting this week, the three recipients from the 14th Annual North Rockland Community 5K Run/Walk were each presented with a check of $9,500. This year’s recipients were Keri Katt, the family of Lauren Bunyan Gould and Hevelin Naranjo. These funds were made possible by the numerous local businesses and participants from the 5K fundraiser that was held on June 4. At this year’s race, Anthony Gizzi, Karen Baumann and the Haverstraw Elks #877 were recognized for their dedication to the North Rockland community. The North Rockland Community 5K Run/Walk committee is chaired by Haverstraw Town Supervisor Howard Phillips, Stony Point Supervisor Jim Monaghan and North Rockland Athletic Director Joseph Casarella and the Race and Volunteer Coordinator is John Casey. The committee is grateful to all those who participated this year and for the generous sponsors of the North Rockland Community 5K Run/Walk who made it an enormous success. The North Rockland Community 5K Run/Walk has raised over $300,000 since its inception in 2004.